Our charity is looking for helpers to work in our candle workshop. We have a volunteer house in downtown Kuching city where helpers live and work on our projects (like plastic recycling) or at our businesses (including our bar and a candle workshop). Check out our photo gallery for pictures of our CANDLE WORKSHOP and the VOLUNTEER HOUSE. We donate 100% of our profits to animal welfare and conservation! 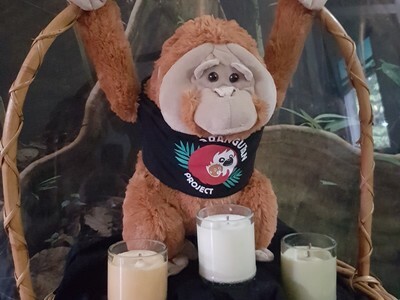 Candle Making - There is almost no recycling on the island of Borneo, so we have transformed a restaurant into our candle workshop to make ethical eco-candles. We upcycle glass bottles, used cooking oil, and aluminum cans to create natural candles that help get waste out of the environment. Helpers will spend most of their time scoring, cutting and sanding glass bottles in the outside area of the workshop. We use hand tools and provide our helpers with a week-long training on how to prepare bottles. Check out our video gallery for the process! Working hours are 9:30am-4pm Mon-Fri at our candle workshop. Helpers average 40-50 bottles a day after the first week. We are looking for diligent helpers who can take initiative and work under minimal supervision. Activities may include cutting and sanding bottles, mixing wax and oil, creating natural coloring, creating wicks, or pouring candles. This depends on what needs to be done in the workshop! At the volunteer house you will have a private bedroom and share wi-fi, a kitchen, fridge, living room and bathroom. The house is a 10 minute walk to most of out locations (see the map in our photo gallery).